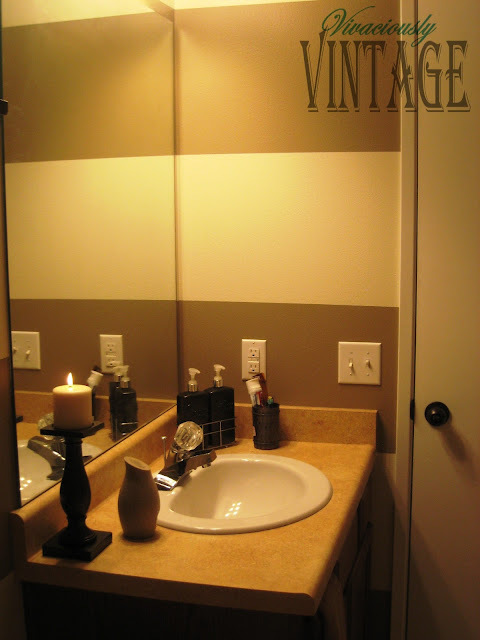 Ansley Designs: Striped Guest Bathroom Reveal! 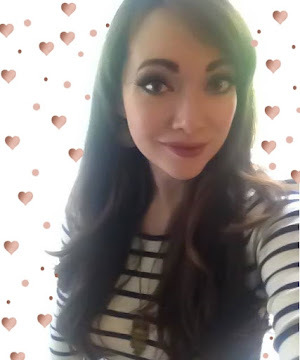 What better way to start off February than with love? So fall in love with my son's bathroom that also doubles as the guest bath...I know I have! Here it is the (almost) completed bathroom! 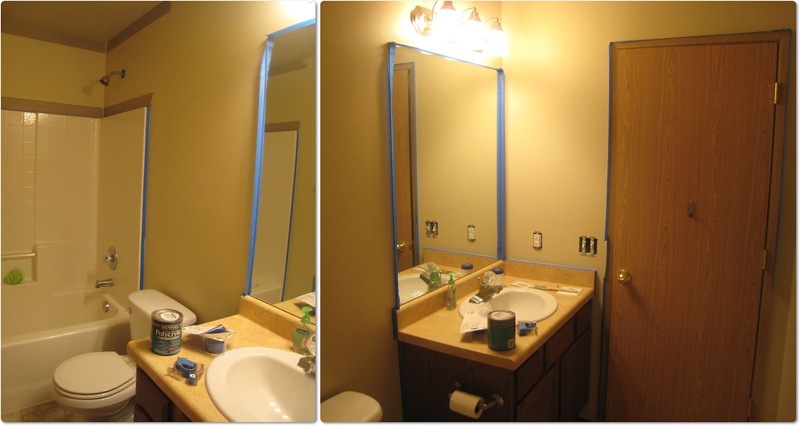 There were so many little projects that I completed for his bathroom. I went a little crazy with the oil rubbed bronze spray paint! I used it on the shelf above the toilet that I scored at Goodwill, the large candlestick on the sink (also Goodwill), an upcycled wine bottle, the soap and lotion dispensers, shower curtain rings, and even the door hardware! You can find the how to on the soap dispenser and the wine bottle here. By far the largest and highest impact project is the painting! 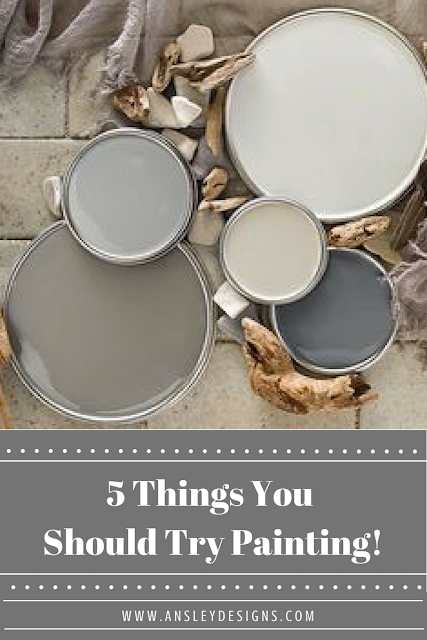 You can find a tutorial on how to paint perfect stripes on textured walls here. 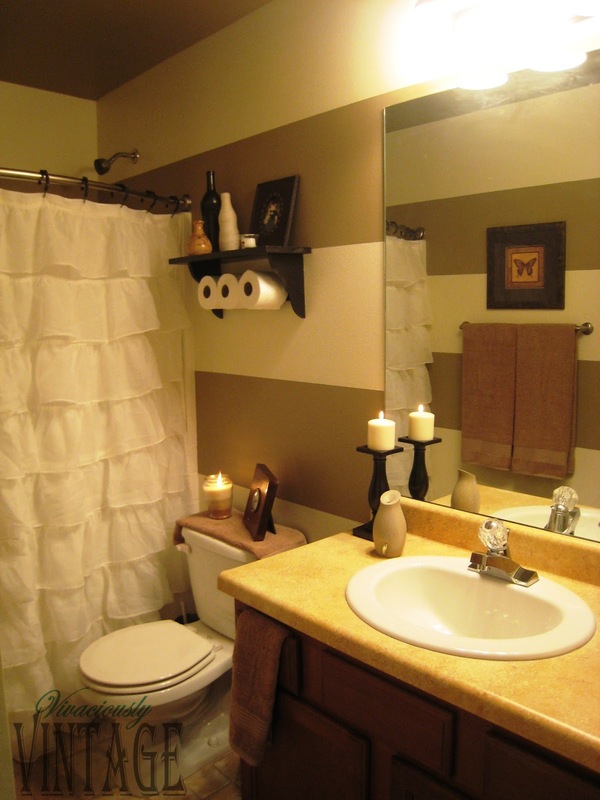 Another super high impact piece in any bathroom is the shower curtain. These ruffled shower curtains are super in right now, and I nearly DIED when I found this cream colored one on Amazon for only $20! I had considered making my own, but it probably would have cost the same amount of money (or more!) in materials - not to mention it would probably have taken much longer than the 5 days it took to ship to my readily awaiting hands! 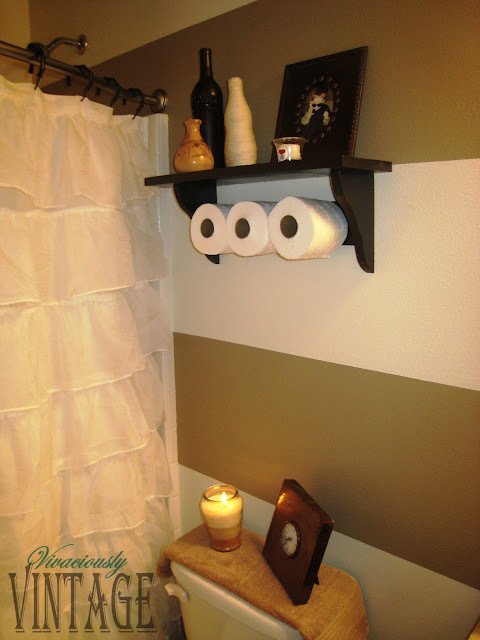 One of the things I enjoyed the most about redoing this bathroom is finding a new life for items I had already! The clock on the back of the toilet was my husband's before we met...and it was just sitting in a drawer somewhere; the same is true for the tiniest bottle that is on the shelf. The frame of my son on the shelf and the butterfly picture on the wall (that you can see in the mirror in the above photo) were taken from other places in our house. While I liked them, I fell in love with them because they worked so perfectly in this space! The part of the bathroom that makes me say that the room is almost finished is pictured below. I need to find something to put on that wall. Originally, I was going to put a towel ring - I even bought one! Sadly with the hand towel hanging on it, it hung too low and covered the outlets. It just did not look right. I am thinking of maybe doing some type of chalk board checklist so he can check off his nightly routine, i.e. bathe, brush teeth, put away clothes and towel, etc. Ideas? And can you believe that all this started on a whim because I was bored during our Snowmageddon? P.S. I'm not sure that this is the EXACT shower curtain I have (I don't remember there being color options), but this one is equally awesome and also only $20!